Appraiser Agosto, lectures on Complex Property Valuation-Valuation Masterclass II. 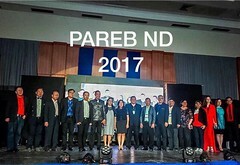 The seminar workshop, held in Castlepeak Hotel in Cebu City, was organized by PAREB Cebu Real Estate Board. The seminar participants reached to more than 80 real estate practitioners, including real estate appraiser and brokers not only from Cebu but also from Negros, Cagayan de Oro and Leyte.”I was stunned by the turnout of participants”, Gus told the organizers of the seminar. “It just showed that practitioners values the seminar”. In the 2-day lecture, participants learned from different case studies actual application of solving appraisal problems using discounted cash flow method, opportunity cost, replacement value and market studies on township development. “Thank you for sharing your expertise on us”, one of the participant shared in the lecture room. “Very knowledgeable in the topics discussed”, another participant shared. The valuation masterclass is a project of PAREB Academy for its members. Its objective is to raise the level of PAREB Appraiser-members professional practice through seminars, workshop and provide linkages through appraiser’s directory. Appraiser Gus Agosto has conducted lectures already in different areas of the country. Hosted by different local board, he traveled Iloilo City, Dipolog City, Cagayan de Oro, Pasig, Caloocan, Lucena, Puerto Princesa, Baguio, and other areas. This is in response to the article of Mr. Ramon Clarete published on 6 January 2019 on Property Valuation Service: Are we losing competitiveness? I thank Mr. Ramon Clarete for his interest in our work and for the stimulating comments which highlights our profession and offer a broader perspective. I am certainly in agreement with the writer on the role of property valuation to economies in weathering crisis. However, I was appalled on some points of his letter and allow me to comment. His assertion on the maturity of the real estate appraisal profession; quality of service and the valuation standards are quiet disturbing. Real estate appraisal in the country is in its infancy stage, as a profession. Even though it started in 1961 but it was considered as a trade rather than a profession. However, on July 2009, the passage into law of the Republic Act 9646 or the Real Estate Service Act of the Philippines (RESA), real estate appraisal has been recognized as a profession and strengthened. Mr. Clarete pointed his pen on the 90% of the appraisers. He consistently mixes the know-how in real estate practice and the quality of service. However, Mr. Clarete misses the point. The number of appraisers might triple in number, but the question is do the opportunities to practice the profession also tripled? To practice the profession, appraisers have been subjected to different barriers that only few can endure. Take for example the government projects under President Duterte, the Department of Public Works and Highways required appraisers to have an accreditation with the Bangko Sentral ng Pilipinas to qualify in a bidding. BSP has its own criteria in evaluating of appraisers outlined in their guidelines “BSP Acceptable Appraisal Companies for Ocular Inspection and Appraisal of Real Estate Properties”. To be part of the list, the appraiser or the appraisal company must comply with certain criteria to be accredited. One of which is the setting of company net worth to P 4 Million; and the other one is the setting of ten (10) years’ experience in real estate appraisal business as a requirement to manage and sign the appraisal report. Securities and Exchange Commission, Energy Regulatory Commission other government agencies and even commercial banks have their own guidelines and requirement. It is not surprising that only 11 companies, as of December 31, 2017, were accredited by the Securities and Exchange Commission, and 22 under the BSP. In the broader context, these accreditation requirements and non-implementation of certain provision of Real Estate Service Act have a multiplier effect to appraisal practice. Negating the appraisers of the opportunity to participate in government projects and practice their profession. And it has been 10 years now. The valuation practice and standards in the appraisal are intertwined. Theories will remain a theory if it will not be applied. Provide the appraisers with the venue to practice their profession, and they will surely rise to a new and higher level of professional practice. I attended a seminar on Philippine Valuation Standards (PVS) recently and spoke to the technical committee members that produce it. The seminar was attended by Assessors of different local government units, nationwide. While the speakers were both members of the Technical Committee on drafting the Philippine Valuation Standards 2017. I outlined the most important points in the discussion, relate to my experiences in valuation and share it with you. Enhance the reputation of the profession and be at par around the world. Currently, there are multiple valuation methods used by different government agencies, local government units, private individuals, and banks. Thus it results in as many conflicting values for the same piece of property. An established set of consistent standards would help in appraising assets and liabilities for financial reporting, especially for companies that control assets in various countries and work across national borders. For valuations for other purposes, the reputation of the profession would be enhanced if the clients could expect consistency in valuation reporting internationally. Simplify the appraisal process. I work an appraisal for a client in U.S. and Australian federal territories, which typically require different standards. But if an appraiser-member of RICS is performing the appraisal in U.K., it should also comply with RICS standards, which differ in subtle ways. PVS is the accepted set of standards for valuation in the Philippine setting. Contrary to some notions, it is not only applicable to the government agencies but rather it includes and should also be applied to bank institutions and private individuals. A single set of standards and guidance notes would enable appraisers to produce a credible valuation with a similar report structure regardless of membership or the location of the asset to be valued. An era of unified professional standards. There are many associations in the country which offer seminars and training for appraisers. All of this would be simplified through learning and adopting valuation standards. Regardless of which association you align with, the pathway for new appraisers to be a competent appraiser need to be consistent. With the Philippine Valuation Standards, the international valuation standards in the broader context, we now have a uniform term of engagements, report disclosures, recognized bases of value, terminology used in reporting and guidance notes. We have valuation standards that are accepted regardless of location or the professional organization of the appraiser. What we need to do now is to encourage consistency and professionalism, further strengthening the public’s trust in valuations. The first step to this could be asking the members of multiple organizations who are active in the various leadership councils to ensure that their members are actively using the relevant sets of standards in their practice and continually looking for ways to streamline the process in a manner that works for all. Our generation should be happy to be in the era in which we have now a uniform sets of standards. But there is still work to be done. We should endeavor to unite appraisers in different organizations and location to study, adopt and implement the valuation standards. In this way, we can raise the level of consistency and professionalism, further strengthening the public’s trust in valuations. Gus Agosto is the Vice-President for Visayas of the Philippine Association of Real Estate Board (PAREB). He is the Managing Owner of AA RealtyPro Solutions, an appraisal and consulting business organization. He also serves as faculty of University of San Carlos, Cebu City and took up Master of Arts in Economics (Candidate) in the same university. Thinking outside the box is essential in the valuation profession. It only makes sense that drones would come to be in the hands of appraisers. In recent appraisal assignments, appraisers’ uses drone in site inspections. Drones provide unique perspectives on properties, giving appraisers more information to use for a credible appraisal report. There are many advantages in using drone for appraisal. One is the ability to access hard-to-reach places. Areas considered previously unobservable such as roofings, gutters, easements and more, can now be seen using the correct equipment. Not only can these items be observed, but areas of interest can be identified for additional inspection. Drones can be specifically useful in commercial properties, large tracts of land where easements and prior improvements can be shown via photographs or video. This allows appraisers to observe and document a property in real-time on the date of inspection and will undoubtedly change the way many properties are viewed going forward. These developments show that valuation profession is not afraid to innovate with new technology. It elevated the practice of profession to a new and higher level. In every appraisal assignment, the appraiser should see to it that the client understand not only the final value, but the appraisal report in its entirety. Appraisal report is the product of the whole appraisal process. It is an important document for decision maker in deciding whether or not to accept any real estate transaction.It outlines the strength and weaknesses of a property. Thus, the conclusion in the report can make or break any real estate negotiations. Beside market value, what are the other factors that a property owner, real estate practitioner or investor should look to in an appraisal report? Here are some of the major factors to consider as you read over the appraisal report. Proper identification of the property.The most important in appraisal is the proper identification of the property. Definitely, wrong property is wrong appraisal. The appraiser should indicate the correct characteristics of the property like shape, size, depth, age, topography and boundaries. Documents such as the property title and tax declaration should match with the public records in the city assessor, engineering, city planning and Bureau of Lands. Market trends. If the market has been going up, but the report says the market is going down, that could not support the final value. The report should show if what is unfolding in the market, otherwise that could lead to erroneous adjustments in the report. Neighborhood Boundaries. The neighborhood boundaries listed in the appraisal report should show the correct similar neighborhood on which the subject property and the comparable (comps) sales are located. It can make a big difference if the wrong comps are used from inferior or superior neighborhoods. Selection of comparables. The comparable used are the good substitution of properties a buyer might consider purchasing instead of the subject property. It should almost identical with the property appraised. Otherwise, it is a wrong comps and questionable. Adjustments.Some reports make an adjustment by just getting the average of the total price of comps in the market. It does not reflect the real estate market and are not reasonable. Measurements. In measuring the improvements, appraisal report should present a relatively similar to official records or to what a buyer know of the property. It is important to double-check, in case of error. Improvements. The report won’t show an adjustment for every single update, but the final value should consider improvements. Keep in mind of course that not all improvements contribute to value. For example, a swimming pool in the backyard probably won’t be a huge plus in a beach area. Qualification of the appraiser. Appraisal report mirrors the experience and qualification of the appraiser. Property owner, investors and real estate practitioners should look for appraisers that are not only licensed but possess a certain level of experience. The report should indicate the client list and types of property appraised by the appraiser. This will show if the appraiser is qualified to do the assignment. Now that you know the important elements of an appraisal report, its time to obtain a copy from your appraiser or bank loan officer. Remember that your property is one of your most important lifetime investments. The money spent on a quality appraisal is well spent. Some property owner downplays the importance of appraisal. In determining the price of certain properties for example, some still uses the zonal value as a benchmark in knowing the worth of the property. Other sees the appraisal as a process of comparing the listing price of properties in an area. There are price-sensitive client that bargains in lowering appraiser’s fee, while there are also reliant on the opinion of certain real estate practitioners in pricing their properties to evade in paying the appraisal fee. There are financial implications on relying to non-expert in real estate valuation. If the practitioner missed some current comparable evidence, is weak in the technical analysis, or errs in the interpretation of data, it might result in aggregate loss in the real estate transaction or losing the whole transaction itself. In our experience, with the help of an appraisal, a property owner was able to make a sound bank loan. An investor uses the advice of an appraiser to quantify risk and project yield; a landowner has successfully inked a joint venture deal using the appraisal; an asset manager gets advice that makes him or her wise decision maker; and a lawyer is able to rely on appraisers’ expertise in litigation and court testimony. Appraisal is not a simple process or just a mandated evil for which a client grudgingly pays as little as possible. Appraisal is a service that, if competent and timely, brings a benefit to a client that far outweighs the fee. Appraisal report is a living document forming the very foundation for decision making. Where else is a client going to get such a detailed investigation of his or her property and its market? It is not just a document that the banker throws into a file and the client never sees. In today’s changing real estate market, solving the issues is the most invaluable contribution of the appraiser. How private appraisals differ from bank appraisal? A lot of people are asking us if we can undertake valuations that may then be used to banks for mortgage purposes. Some also uses the bank appraisal fee as an argument to demand for a much lower appraisal fee from the private appraisers. On the first question, our response is that some lenders do not accept a valuation from a third party appraiser, they have their own in-house appraisers. But getting the services of a private appraiser is beneficial for the landowner; it can be use in negotiation with the bank for a higher loanable amount. Why bank appraisal has lower fee than the private? It is pretty simple, the banks will profit not in the appraisal but rather in the home loan transaction. How then private appraisals differ from those provided by banks? Banks are interested in quick turnaround, thus the valuer assigned has to conduct valuation based on bank standards. Bank also has policies that served as guidelines to their in-house appraisers that concur to the company policies on home loans. There are few appraisal companies that are successful in getting appraisal jobs from banks. They are mostly accredited by the Central Bank. Fees are low and turnaround time from receiving instructions to having to send the appraisal report is short. Situation that newly passed appraisers cannot cope up. However, if a client gets the services of a private appraiser, they can instruct the valuer directly for their own purposes. Not to side with the client, but in providing unbiased report. The most important client can expect as a minimum is a quality and independent report. Appraiser Gus appointed and subpoenaed as an expert witness in San Joaquin Superior County Court, Stockton, California. The court is determining the value of properties located in the Philippines which is under dispute and for disposition. “I am humbled for the appointment and the opportunity to appear in a US Court as an appraiser witness.” Appraiser Gus replied upon knowing the order. Prior to his appointment, Appraiser Agosto has served different trial courts in the cities of Lapulapu, Cebu, Mandaue and Talisay as court commissioner. Beside working in the court, he has served clientele both in private and public. Some of them includes Miraizo Group of Hongkong, General Milling Corporation, SMC Lighterage Corporation, Southwestern University, Pilipinas Water Resources, Inc. and University of the Philippines. He was the former Managing Partner of Intech Property Appraisal, Inc. and Magaca Appraisal Konsult. Appraiser Agosto is a National Director of the Philippine Association of Real Estate Board, Inc. He is also a faculty of real estate management and finance in the University of San Carlos, Cebu City. Having a view on the macroeconomic trends is critical when analyzing the real estate market. Real estate does not operate in a vacuum. Thus, it is essential for a real estate practitioner to grasp the role of the industry and knows the current events and how macroeconomic affect the real estate market, both in the aggregate supply and demand and the expectation of the buying public. Real estate plays an important role in the economy. Residential real estate provides housing for families. It is the greatest source of wealth and savings for many families. Commercial real estate, which includes apartment buildings, create jobs and spaces for retail, offices and manufacturing. Real estate business and investment provide a source of revenue for millions. Real estate, renting, business and construction are both measured by, and contributes to Gross Domestic Product (GDP). As shown in the graph, its growth continues. In 2016, it contributed P1.8 trillion, 13 percent of the country’s gross domestic product. It exceeded its 2000 record of P3.5 trillion. At that time, real estate, renting and business was a hefty 9 percent component of GDP. Private construction, which is mostly done by property developers and individuals, contributed P1.2 trillion in the gross domestic product. It is one of the contributor in providing employment and help in lowering unemployment rate. Beside GDP, real estate market in the country is fueled by increasing foreign direct investment. Since 2007, the accumulated foreign direct investment totalled to P 2.1 Trillion. Meanwhile, the overseas Filipino workers remittances increases by 17% . From 22 Million in 2013 to $ 26.8 Million in 2016. Understanding key real estate relationships has a strategic implication on real estate decision making and portfolio management. The changing real estate environment can be linked to the macro-economy. Knowing the relationship between macroeconomic variables and real estate performance , and knowing whether these links are consistent or changing overtime ca provide a useful tool in leveling up our service to our clients and to our daily real estate practice. In every site inspection, an appraiser will surely draw cameras to take pictures of the property. As the saying goes, a picture is worth of a thousand words. This holds true in appraisal. Pictures play an important role in the whole process. Some clients like banks require photos of the properties; but others will ask why there is a need in taking pictures. They are thinking of their privacy. Let’s discuss the importance of taking pictures in the appraisal. First, it forms part of the appraisal process. In every appraisal report, you can notice pictures of the property in the annexes or addendum of the report. This helps the appraiser in telling the story of the house and will support the valuation and assumptions provided in the report. Photos can highlight condition, layout, and quality of a house, building or a tract of land. Since no one except the lender or the property owner will read the report, you are assured of the confidentiality and privacy of your properties. Second, it serves as back-up to the appraisers’ memory. When an appraiser takes photos, the appraiser can remember what the house was like. For instance, there have been times when I labeled the floor as vinyl during my inspection, but the photos clearly showed the floor was ceramic tile. Or maybe in the sketch showed only four bedrooms, but there were actually five based on my photos. Everyone makes mistakes, and that includes appraisers. Third, it’s documentation. The pictures will greatly help the appraiser if he will be called to testify in the court or any government proceedings. Since most litigation requires an appraisal of value at the time of taking, photos can be a tremendous tool to assist the appraiser’s description of the property. Few weeks ago, a client asked me to value a property for litigation purposes, I took pictures of the property. Come court hearing, the judge asked the condition of the property, thus I shared in court the pictures I took during the site inspection. Now you know why an appraiser takes pictures of the properties. Instead of worrying, help the appraiser take good shots by turning on lights and keeping away dogs.